Dara Curran squeezed home to win the RaboDirect Hilary outing at Portmarnock Golf Club. The man from neighbouring Portmarnock Links, helped by a rare birdie at the difficult 17th, fired a 70 to edge out The Island's Fergal Kennedy on a tie. Another Island member, Irish international Paul McBride, won the gross with a splendid 73 in somewhat benign conditions on the North Dublin championship links. With just one round remaining, Royal Dublin's Darragh O Malley leads by two shots in the race for the coveted Gold medal-awarded or the player with the best nett scores in the series. McBride, meanwhile, has a clear lead for the Silver Medal awarded to the player with the best gross scores throughout the series. However, he will not be teeing it up in the last event of the season at Sutton Golf Club on Friday April 25th as he's heading to the US for the Junior Invitational at Sage Valley. The final event of the 2014 RaboDirect Hilary season took place at its spiritual home of Sutton Golf Club on Friday last. 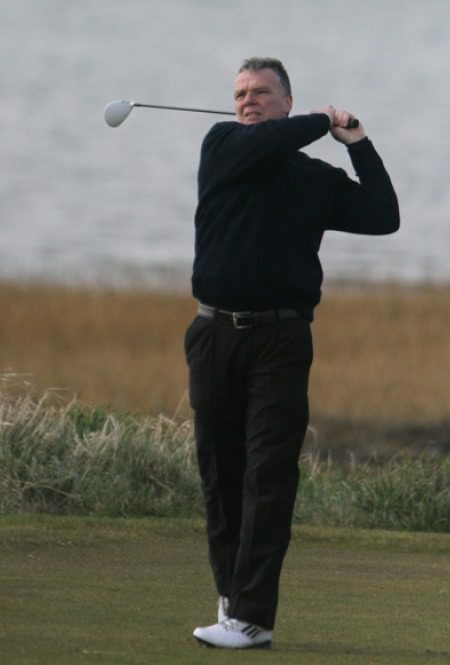 David Brabazon drives on the third en route to victory in the Hilary outing at Pormarnock. Photo Jenny Matthews/www.golffile.ieDavid Brabazon cruised to a clear-cut victory in the RaboDirect Hilary outing at Portmarnock Golf Club last Friday. The Island's Robert Hutton won the second RaboDirect Hilary Golf Society outing of the season at Portmarnock Hotel and Golf Links. Ulster Boys champion and Irish international Paul McBride fired a five under par 67 to win the RaboDirect Hilary outing at County Louth Golf Club.